Birmingham City Council came up with the term Winterval back in 1997, and I don’t care if I am the only person in the two universes who loves the word. It combines winter, carnival and interval, which is what I want at this time of year. Because I’m off work but not going anywhere, it just has a very different feel to the rest of the year. I hadn’t realized that the first page would be visible behind the following pages. I’ll treat that as a feature rather than a problem. The project is feeling fun now; I worked on it a bit when we were going for a curry this afternoon. It looks a bit bare at the moment, and I'm having a bit of an odd week next week, so I'm not sure when it will feel 'finished'. Hopefully I won't get stuck on the first page for a whole month. I'm taking a trip to Utrecht next week and the plan is to travel very light, so the journal may just stay at home for a few days. I feel like that isn't in the spirit of having a journal, but I want to have room in the luggage to bring home Miffy stuff. Yes, it's done and ready to hand over at the next Guild meeting. Seeing it finished, I do like the intense texture of it. P is reminded of Van Gogh's Starry Night. The polka dot pattern shows at the edge, which looks a bit odd but not awful. But where are the beads? Well, when I finished the couching, I did try scattering some small (plastic) pearls and some clear seed beads on it, but the beads stood out from the threads, when I had imagined they would blend in. So a final bit of learning on the piece: beads at the end stand out, not blend. 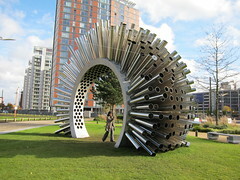 Finishing early did mean I didn't have any crafting to do while taking the bus to see the Aeolus Acoustic Wind Pavilion while it was at Salford. It is such a neat sculpture! I had expected it to sound like a flute, but it makes a more science fiction atmospheric sound. I had missed it when it was at Lyme Park, so it was a great treat to see it on the last day of the Manchester Science Festival. If you find out it is on tour near you, I recommend you see it. 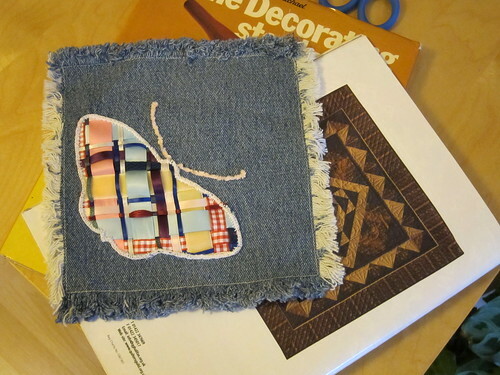 So, with the indigo square done and just one more day until November, am I ready to Nanowrimo? Oh, yeah! I decided I needed a pencil case because my new bag seems to eat pens. They get sucked down into an inaccessibly narrow pocket, requiring far too much effort to get out again. 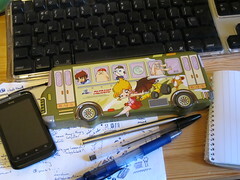 So yesterday, I pop into one of the China Town gift shops, and found a pencil case shaped like a bus! It also has a girl with bat wings, and I've had a note about wearable bat wings to put in my story for about two months now. It's as if fate is guiding me. 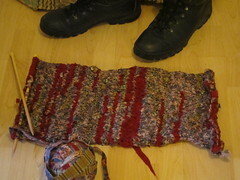 I've not been working hard on the knitting, but it seemed to be going along alright. The patterns and colours are blending nicely, and the texture of the knit feels great. 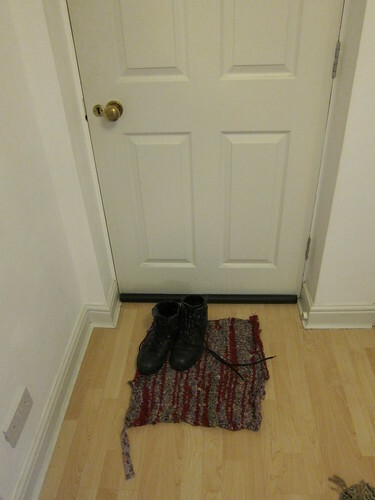 Then I took a look at where I'm planning to put the rug, and it's just a bit too small. Those are my P's boots in the picture, to give a sense of scale. After a bit of thinking, I've decided to unravel it and start again, but cast on 1.5 to 2 times as many stitches to start with, something closer to 50 stitches than 25. I'm not in a rush. 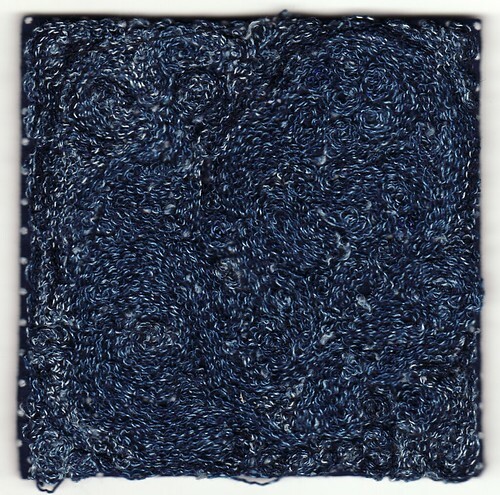 I've also been slowed down in the knitting by reading "After Dark" by Haruki Murakami. I just picked it up at the library because I liked the cover, but it's a great read. I was a bit, I think the term is nonplussed, though that is exaggerating, to discover Mr Murakami is such a popular and influential author, as I honestly hadn't a clue about his work. I liked the book so much that I rationed it, forcing myself to only read it for a little while at a time, to make it last longer. The last idea on the list- making a toggle from plastic bits- seemed the best one. It's like a legal tag, not one of my favourite bits of stationery, but a tried and tested fastener. Also, it uses up stuff I've horded and doesn't require buying anything at all! Win-win, as they say. The toggle is made from the little tube from the squirter bit in a deoderant bottle, pierced by a thumb tack then trimmed down to size. The plastic tube is easy to punch through and the hole made is easy to get a threaded needle through. Win-win, again! 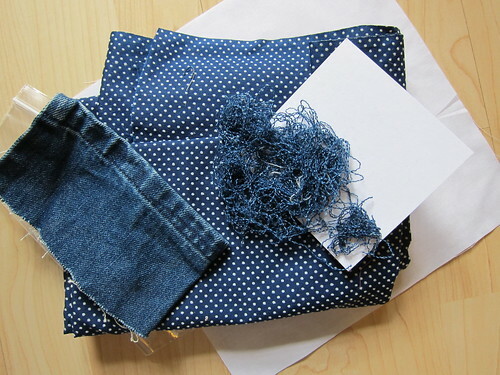 The thread shank is made by pulling the thread through the fabric, then the hole punched in the tube, tieing it around the toggle square knot-style so there's a shank length, going back into the fabric, holding the toggle so both lengths of the shank are the same and doing a little back stitch knot. Easy. A normal hole punch at the top of the cardboard spool to attach it with. Easy. Not sure if it's a win-win, because the aesthetics come into play here, and this prototype does look rough. I like where this is going. Needs a bit of measuring, and I'll need to find the right fabric to use. Not sure if I want to pretty up the toggle or not. I could try putting beads on each end, running the tread through the tube to give it a bit more colour, but I kind of like the way it looks now, a bit rough and functional, not fussy. I feel like it's enough to be getting on with. The thread wrapping is going too quickly. 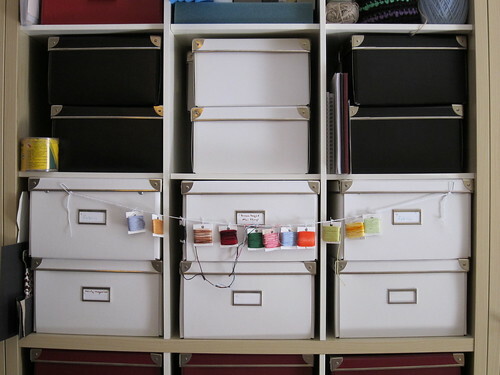 By Tuesday, I had wrapped all the spools I had cut from an old tea box. So now I need more spools and a plan for the garland/banner/hanging thingumy before I can make progress on this project. Mom: No, the flowers aren't toys. They were just for the protest, so I could find you in the crowd. This concept was explained further, but the children found fault with it. Child 1: But what if another child had a flower? Would you take them home instead? Mom: No, I'd still recognize you. Child 1: But what if the other child was cute? Mom: I'd recognize you by your voice. Child 2 (between crisps): But what if they had mouths like us and sounded like us? Mom: I'd recognize you by your coats. Mom: Yes, if they had a flower, and the same coat, and sounded the same, and had the same bracelet, then I probably would have taken them home instead. The bus was later graced by giggling teenagers, not nearly as entertaining. One of my 40 Things projects is to find 40 of my favourite colours. What's this "40 Things" you may be wondering? Well, this is the year I turned 40, and so rather than do a New Years Resolution, I put together a list of 40 Things to do 40 times, or with 40 different stitches, or some other count to 40. One of the things on my list is 40 Favourite Colours. I'm sometimes jealous of people who have a definite favourite colour. I generally like green, and I can remember both blue and red being favourites at different ages. For a while now, I haven't felt an affection for any given colour. Also, I've lost confidence in choosing colours. So, identifying 40 colours that I genuinely like seems like a fun and helpful project. 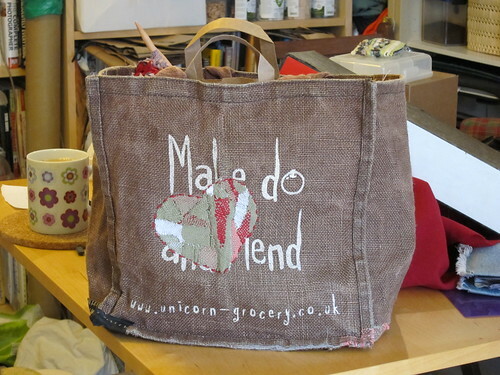 Anyway, to get back to the story, at the Guild meeting last weekend, another member had brought in a bag of yarn to give away. 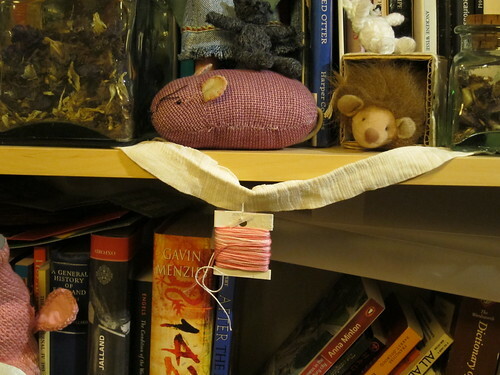 I'm still trying to get rid of stuff, but I just loved the colours in the tangle of yarn. Luckily, the yarn was mostly scraps, and fairly short lengths at that. 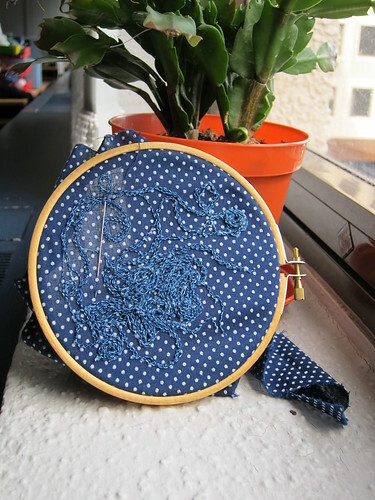 I pulled out a sample of the colours in a tangle I particularly liked, and rolled them up into little balls on the bus (to the great amusement of an elderly man who sat beside me one evening; he actually chuckled when he saw what I was doing). I had originally thought of displaying them in a small frame, but I don't have a frame to hand, so they will live in a bag in my yarn pile for a while yet. 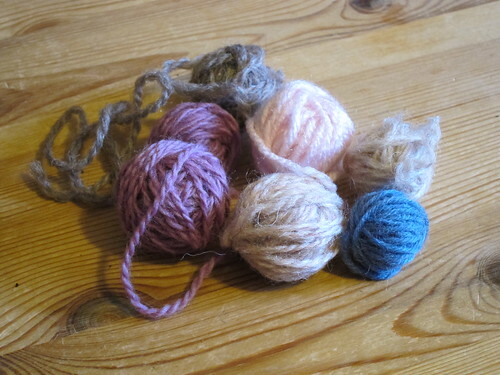 I'm now thinking I should have two frames- one of tidy balls and another of the same yarns all tangled up. But maybe I'm just making things too complicated. I'm surprised at liking a purple-brown combination, though one of the browns is technically a grey and another is an orange. It seems I'm also surprized by which colours they actually are. 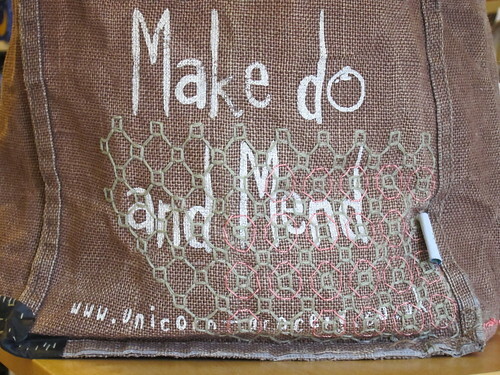 The mending on the parsnip bag needed some touching up. 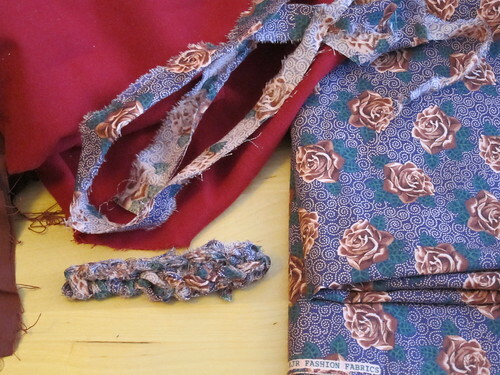 The duct tape at the top was pulling away from the fabric, taking the plastic lining with it. You can see this a bit in the photo here. 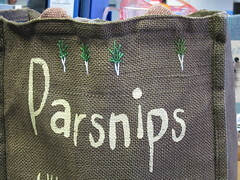 I noticed this, oh, about two weeks agao, but it was only Friday night that I decided to stitch a few more parsnips while at the Embroiderers Guild meeting on the weekend.